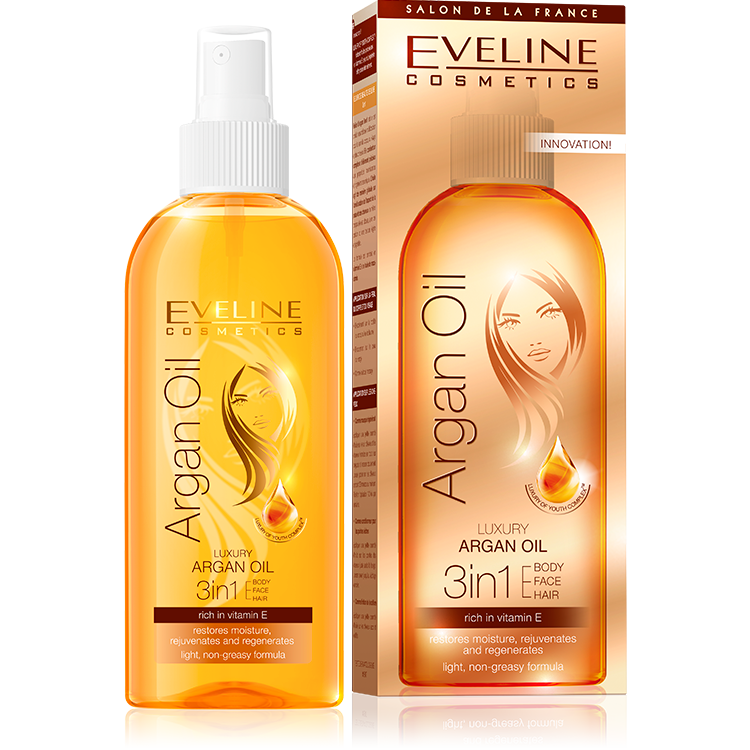 Argan Oil 3in1 is a multi-purpose cosmetic for body, facial and hair care. It contains a complex of precious ingredients with unique nourishing and regenerating properties. The oil improves the overall appearance of skin and hair. At the same time, it is gentle, with a lovely scent and light, pleasant consistency. Argan Oil 3in1 owes its properties to a unique combination of fatty acids and vitamins which stimulate intracellular skin regeneration processes, enhancing skin’s elasticity, firmness and visibly improving its appearance. The oil effectively inhibits aging processes, prevents wrinkles and smoothens the existing ones, improving the overall appearance of skin. Assists regeneration of the hydrolipidic film, restoring long-lasting moisture to the skin. Perfect for dry and damaged hair care, allows hair to quickly regain shine and strength. Day after day, the skin is more beautiful, smoother and full of natural radiance. Vitamin E — also known as the „elixir of youth”, with strong antioxidant properties. It effectively protects skin from the effects of free radicals, delaying skin aging processes and preventing wrinkles. Protects from harmful effects of external factors. Macadamia oil — thanks to unsaturated Omega-3 and Omega-6 fatty acids and minerals necessary for correct functioning of skin cells, it intensely moisturizes and rejuvenates skin, restoring its elasticity. Applied to hair, it regenerates, smoothens, nourishes it and makes it shiny. Used on the face, the oil smoothens wrinkles and visibly rejuvenates. Used on the body, it intensely regenerates skin, restoring its elasticity, firmness and attractive appearance. Argan Oil perfectly strengthens dry and damaged hair, restoring its healthy shine. The hair becomes stronger, thicker and more shiny and the ends are moisturized and regenerated already after the first couple of uses. Gently massage a small amount of oil into the scalp and damp hair from roots to ends. Leave it for at least 30 minutes. Repeat once or twice a week. Rub a tiny bit of oil into hair ends directly after washing. Leave to dry. Rub a tiny bit of oil into dried, styled hair.